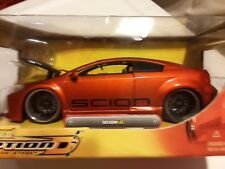 New ListingJada Toys Scion tC Import Racer 1:24 Scale Candy Red Die Cast Model. New in box. Exact model shown. Factory sealed in near mint box. Shipping will be figured by eBay’s calculator based on your location. Options for parcel post and priority mail are available. Magazine edition SCION xB1:24 scale diecast model. Item / model # 90025. Very cool under-hood and interior detailing too, including custom fiberglass subwoofer enclosures for four drivers with a video screen and amplifiers in the back. Hey everybody, here is another Jada Toys 1:24 Scale that is "Off the Chain"! This is the Jada Toys Dub City 1:24 Scale Scion Xb in Electric Orange Rollin! Hard to find this Scion Xb in this Color. Very good almost like new condition. Jada Toys Import Racer Toyota Scion tC Option 1 in candy apple red. 1:24 Scale. Jada ToysDie Cast Scion tC Import Racer 1:24. Unopened b ox. (MISSING DRIVERS SIDE VIEW MIRROR). Outer Box not included. Maisto 1/24. Ready to be put into a collection & displayed! By: Jada Toys. Die Cast Scion TC (2005). Candy Apple Red Import Racer. 1:24 Scale.